In an open meeting hosted by the King’s College Student Union (KCSU) this evening, a motion that will see a ‘Wall of Flags’ replace the Soviet flag that was voted to be removed last term in the college bar was passed. The motion was put forward by KCSU LGBTQ+ Officer and will see the LGBT flag being the first of many to be hung. 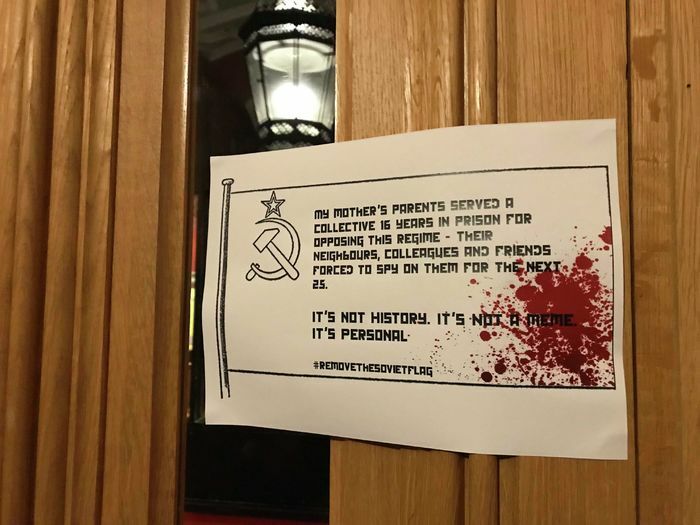 At the end of Michaelmas last term, King’s College students debated about whether or not the Soviet flag that hung in their bar since 2004 should be removed. It was overwhelmingly voted to be removed, with 86% of undergraduates and 56% of the graduate population supporting its removal. The motion passed this evening stated “the Soviet flag was removed primarily because it was considered hurtful, offensive and exclusionary to King’s members whose families suffered under Soviet rule”. At the meeting, the LGBTQ+ Officer stated that it should be replaced with “something that represents inclusivity in King’s”, suggesting the LGBT flag should be the first flag to go up. They stated it would be a symbol that would contribute “to a sense of welcome and belonging to the LGBT members of the community”. The motion hoped to make sure there would not be a “single totalitising symbol, but rather a variety of symbols” in a space as communal as the bar. The motion also included a resolution to ‘hang a plaque to outline the history of the Soviet flag’s removal and the intention behind the ‘Wall of Flags’’. Assessed by a show of hands, the motion was passed with a clear majority, with nobody speaking against the motion.